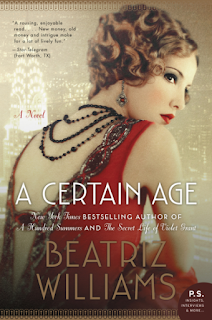 As a lover of both historical fiction and Downton Abbey, I was delighted to pick up a copy of A Certain Age by Beatriz Williams. It opens with a newspaper article for a murder trial and then we are taken a few months back in time to begin the story. For me this was a very atmospheric read. Gatsby-esque with romance and a murder mystery. I particularly loved the strong female characters who had me rooting for them throughout the novel. I also enjoyed the writing style. I love it when a book speaks directly to the reader now and then, like a cheeky little secret. It adds an element of fun to the story. It did take me 40 pages or so to settle into this book, but overall if you're craving a book about the roaring 20s, this will certainly be the perfect read for you! You can connect with Beatriz Williams on Facebook, Twitter, Instagram, and her website. A Certain Age is available for purchase from Amazon and HarperCollins. Disclaimer - I received a copy of A Certain Age courtesy of HarperCollins and TLC Book Tours. All thoughts and opinions are entirely my own.